Nestling between large shady trees in the heart of the Ikhutseng Nature Reserve is Motswiri Lodge - a true "place of rest". The welcoming sight of the thatched main lodge with its unique African décor, hand-crafted furniture and sprawling views of the open plains, beckons the visitor to relax in the comfortable lounge or settle down on the stone-paved deck at the fire-pit to watch the game at the watering hole. A well-appointed bar with a full range of international beverages is the ideal place to meet for a pre-dinner drink before moving either to the cosy dining room for an intimate dinner or, in true African style, to dine "al fresco" in the open-air boma around a roaring log fire. Accommodation at Motswiri Lodge is a blend of the ultimate in luxury living, combined with the essence of a bush experience. Each luxury safari tent has a spacious bedroom decorated in ethnic splendour, with full on-suite facilities plus the option of using your very own invigorating open-air shower. The six superbly appointed safari tents, raised on platforms, are widely spaced giving absolute privacy, out of sight and sound from fellow guests. The essence of the Ikhutseng Experience can be found in the wild life experience designed to make the most of your stay at the reserve. 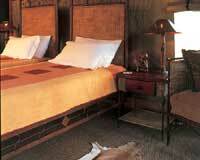 Service and attention to detail are the cornerstones of the magic that is Motswiri Lodge. A sumptuous breakfast precedes an afternoon of relaxation and leisure at the pool-side or you may choose to browse through the curio shop. High tea and refreshments mark the second half of the day's programme which includes a sundowner drive that turns into an exciting night drive, followed by a traditional dinner in the boma, around a crackling fire, listening to the sounds of the wild and exchanging highlights of yet another perfect day in Africa. 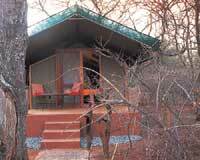 Motswiri Lodge has a total of six safari tents offering accommodation for 12 people. Price includes VAT.Subject to change. Check-in time 14:00 and check-out time 11:00. According to availability early check-in and late check-out times can be accommodated.